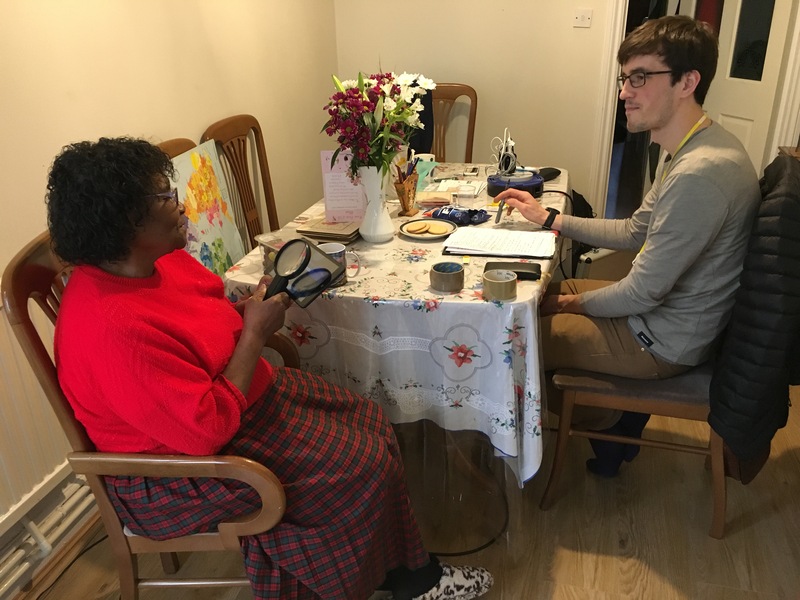 This page describes what you need to do to prepare for a Cold Homes Energy Efficiency Survey Experts (CHEESE) survey, what will happen on the day, and how we will follow up with your progress afterwards. To save administration time for our largely volunteer staff, we do ask that you pay in advance for your survey. This is priced according to the number of bedrooms plus living rooms, because this affects the time taken on the survey. See our pricing for various sizes of homes. Please make on-line payments to The CHEESE Project. Sort code 08-92-99, account number 65849565 with your name as reference. Cheques should be posted to: Mike Andrews, Managing Director, The C.H.E.E.S.E. Project CIC, 28 Seawalls, Seawalls Road, Sneyd Park, Bristol BS9 1PG. We recommend that you switch on your heating for 24 hours before the survey to thoroughly warm up the fabric of the house (this is to create a difference of at least 10 degrees between the house and the external temperature). Please make sure that all radiators are turned on; however you might want to adjust the temperature of individual radiators/rooms so that rooms do not become uncomfortable, particularly at night. Please also note, if you feel that you're unable to keep your heating on for this length of time, contact us at: surveys@cheeseproject.co.uk so we can work out the best approach for you. Switch off/stop any wood burners, open fires, Agas/Rayburns, gas fires etc. two hours before the survey. This is important since we will reduce the pressure inside the house during the survey, and this might draw exhaust gases or smoke into the house. For the same reason, block chimneys (with a pillow or cushion in a plastic bag, or a chimney balloon) and cover any open fireplaces to prevent soot from being drawn into rooms. Clear away any items that will make it harder to spot draughts and cold spots (e.g. on window sills, furniture in corners), and to make it safe for the surveyor to move around easily without tripping etc. Ensure there is a space for our thermal-imaging equipment, such as a kitchen table or worktop, and a nearby plug socket for charging. Switch off the central heating. It is very important for us to record data on energy use so that we can measure whether energy is being saved, and how much. We want to compare your energy use before the survey with it afterwards. To do this, we ask you to find out your total energy use for the year before your survey. One year after your survey, we will contact you again to ask you to calculate the same figures for comparison. If you are not sure how to calculate these totals, then we can calculate them after the survey with you. It is important that we collect energy use figures that are based on meter readings, rather than estimates made by the energy provider, so that our analyses are accurate. If you do not have meter readings available, then we can mark the figure as an estimate. 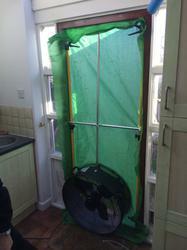 A CHEESE blower door installed during a survey. 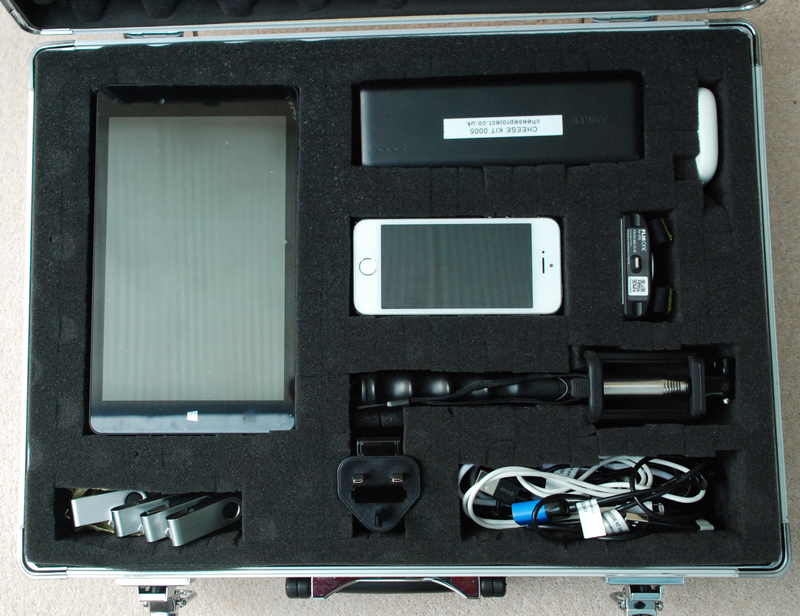 A CHEESE thermal imaging kit. For a five-room house (living and bedrooms) a survey will take approximately two hours, including a de-briefing at the end. Larger houses will take longer, a flat somewhat less. See the survey information page for survey timings based on building size. Two Energy Tracer surveyors will arrive. One will be the lead Tracer and they will usually accompanied by a trainee Tracer who will be shadowing and aiding them. 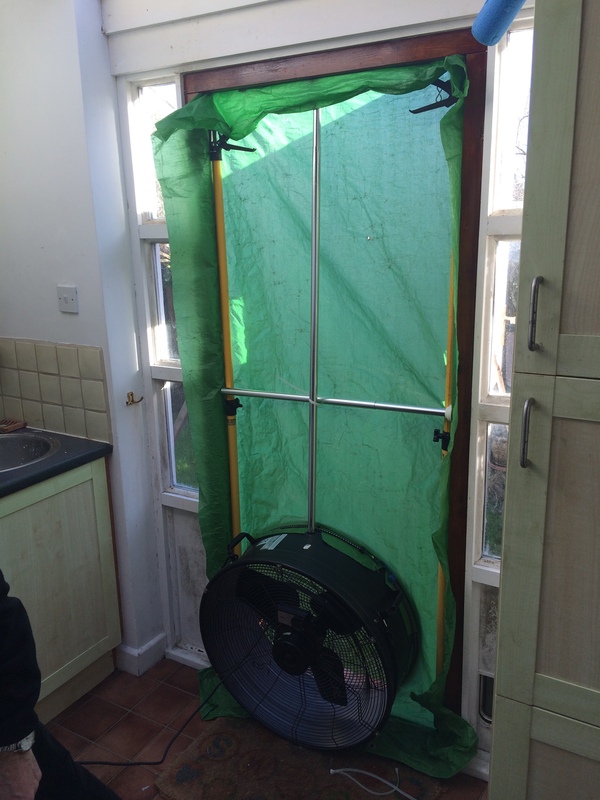 A blower door, consisting of a large fan and airtight sheet, will be fitted to a suitable external door. This is used to reduce the pressure inside of the house slightly to induce draughts. You will not be able to use the door it is fitted to for between 1 and 1.5 hours and it will also prevent anyone else having access if, for example, it is a shared doorway. Please note that the fans we use are large and relatively noisy, but are essential to obtain good results from the thermal imaging. We encourage your participation and engagement throughout the survey, since it is led by your own knowledge of the building and because it is important you see for yourself where heat is being lost. As the thermal survey is conducted you will be able to watch the images on a tablet computer. Children will probably enjoy the survey. During the survey a video with sound will be made, recording what is found together with interpretation comments by the surveyor and your own comments. Still thermal photos are also recorded. Following the de-briefing on the findings at the end of the survey you will be given a recording of the video and its sound commentary on a memory stick (or DVD if requested in advance). This will also contain information from The Centre for Sustainable Energy (CSE) on how to deal with energy saving opportunities. Finally, we will optionally lend an energy-monitoring kit (a CHEESE Box) to you for one month, which includes a meter which we will fit for you to your incoming electricity supply. We will arrange a suitable time with you to return and collect the box. We will ask you to feedback on the actions you have taken (or plan to take) as a result of the survey, approximately one month after. We would also like to hear any thoughts or comments you have on the survey and use of the energy-monitoring CHEESE Box. For reference, you can take a look at the one-month feedback form here. The form can be filled in by you, or by an Energy Tracer on your behalf over the telephone or in person. Your actual (not estimated) energy use since the survey. This is to compare with the figures we recorded on the day of the survey. We would like you to calculate the total kilowatt hours of electricity and gas you have used that year, from your bills, as you did before the survey. What actions over the year you have taken to reduce energy use. We would also like to know how much money you have saved as a consequence of saving energy, from your bills. Any other comments that you might have. As with the one-month feedback form, the one-year feedback form can be completed by you or by an Energy Tracer on your behalf. 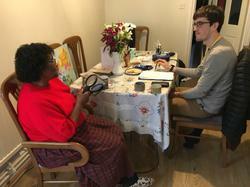 We find that following a CHEESE survey, people may continue to take action for years afterwards, reviewing the video again and again as they gradually deal with the problems it reveals. We will always be glad to hear of your progress in retrofitting and energy/money saving. Collection of some personal data is necessary for the operation of the project, so that we can find out what action has been taken after a survey, and the effects of these actions, and so we can collect data city-wide on building faults and energy savings. We limit this collection to what is absolutely necessary, and are transparent in the ways we process and store personal data. Please read our privacy notice for more information.